Close-up of one out of three old prayer rugs with calligraphic inscriptions (a poem in Persian), written in Arabic script. Silk and silver wire (on fine wool) were used for this knotted rug. The whole carpet measures 175 x 111 cm, and has 1.440.000 knots per square meter. Knowing that a skilled weaver makes about 4000 knots a day, this rug represents two years of labour. 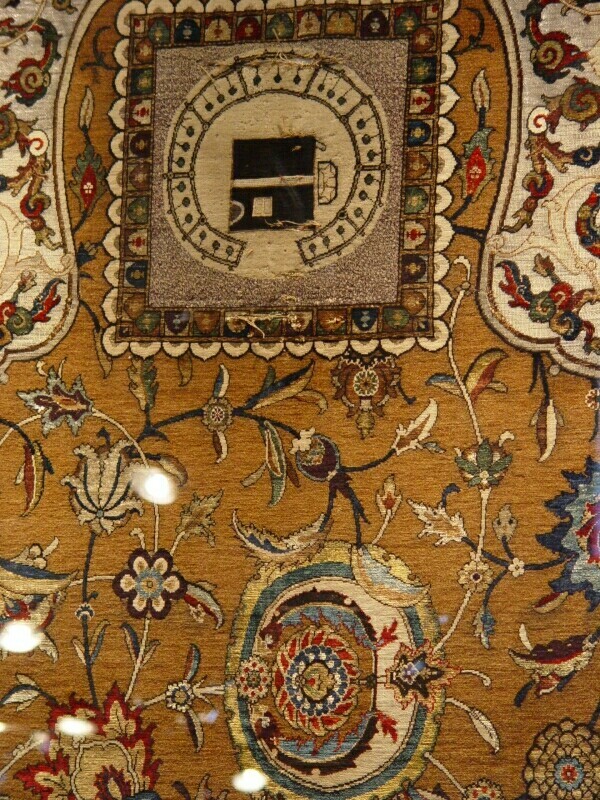 The motif of the Kaaba in Mecca is rare on old rugs; only two other examples are known in Turkish museum collections (a 17th century rug in the Museum for Turkish and Isslamic Arts in Istanbul, and another 19th century piece in the Mevlâna Museum). This rug is thought to have been woven in Iran around 1500, and to have been part of the spoils that Sultan Selim I made at the battle of Çaldıran (1514), where he laid hand on the imperial campaign tent (+ its content) of Shah Ismaël. Following this victory, Selim came to Konya, where he ordered the restoration of Mevlana’s türbe (mausoleum) and made many gifts to the Tekke.